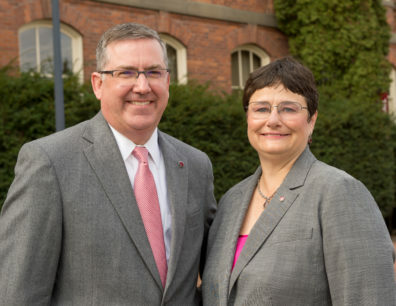 Washington State University’s First Couple shares their lessons and advice learned over the last 30 years as they have worked to integrate family and their careers as well as having fun. Kirk and Noel met as undergraduates at Virginia Tech in the mid-80s. Over the last 30 years they have worked to balance both their careers and goals with their family and personal activities. This session will discuss their similarities and differences and handling this as a couple, goal setting, time management ideas, strategies with family and advice for communicating as a couple. They will provide suggestions for helpful books and other resources. Additionally, attendees will have a chance to interact and ask questions throughout the workshop. Kirk and Noel have two sons, Tim (26) and Andrew (22). Tim finished his BS in CS at Mississippi State and his MS in CS at the University of Tulsa. His wife, Tricia also an MS in CS graduate from Tulsa, and he work at Sandia National Laboratories in Albuquerque, New Mexico. Andrew is a first year senior at Oklahoma State majoring in mechanical engineering and mathematics. All PDI events will be available to sites other than Pullman through a web link that will be emailed to you before the event. Please make sure to register on the link below and indicate at which WSU site you are located.